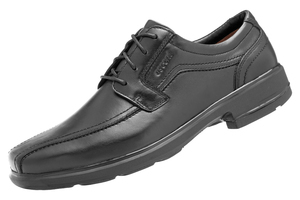 With slip resistance that’s second to none, and a versatile business shoe look, Contest is the ultimate hospitality shoe! 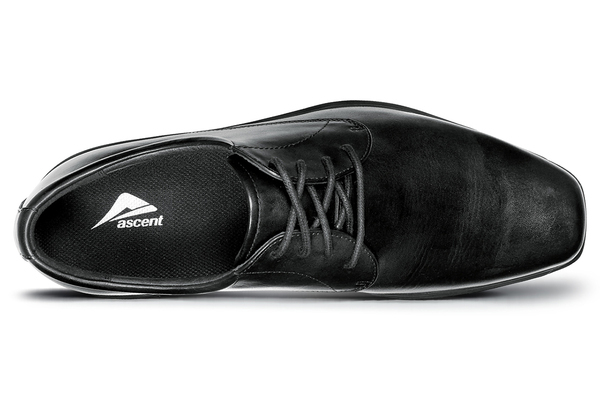 Ascent’s anti-slip design, Diamond Grip, is set to the highest Australian safety standards for slip resistant footwear. Benefit: Provides sufficient slip resistance to prevent a fall when working on a low friction surface such as oil spilled on metal, or on soapy wet tiles. This is the highest level of slip resistance. What is it: Australian Standards 2210.3:2009 Additional Classification. Glycerol (oil) on steel floor test. Slip resistance coefficient only heel contact is > 0.13, and slip resistance coefficient with whole shoe flat contact is > 0.18. SLS (soapy water) solution on ceramic tile test. Slip resistance coefficient only heel contact is > 0.28, and slip resistance coefficient with whole shoe flat contact is > 0.32. Slip Resistant with Oil on Metal, and with Water on Tiles. Benefit: Achieves the highest slip resistance rating (water on tile and oil on metal). What is it: Trilateral grip tread pattern, incorporating deep channels to maximise surface contact in slippery conditions. Where is it: On the bottom of the shoe where it contacts the ground. Benefit: Arch support insole with increased arch support and more cushioning. Removable, and so able to be replaced with orthotics if needed. What is it: Specially formulated BUNGEE foam formed to cup around the heel and under the arch (thicker under the arch than our normal arch support insole providing more support). 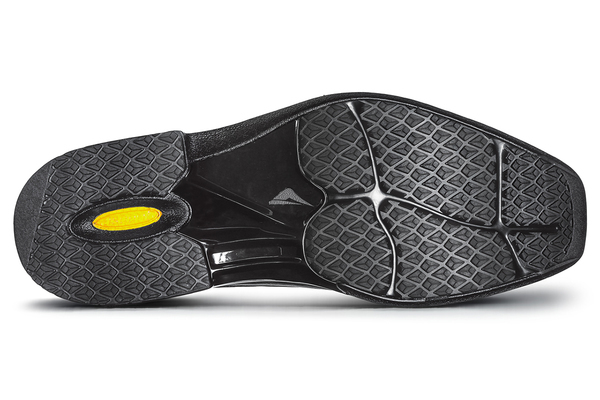 Holes distributed from the forefoot and around the arch, combined with channels moulded into the bottom of the insole promote airflow. Where is it: Inside the shoe, directly under the foot. Benefit: Customised fit to suit any foot type. Add extra cushioning or remove the bottom later for extra width. 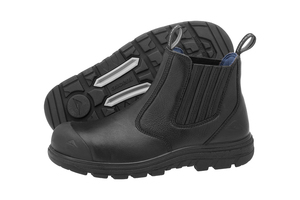 What is it: Top later is a BUNGEE cup insole, which provides cushioning and arch support. Bottom layer is an Ortholite insert for cushioning. Benefit: Soft, lightweight cushioning that absorbs impact shock. 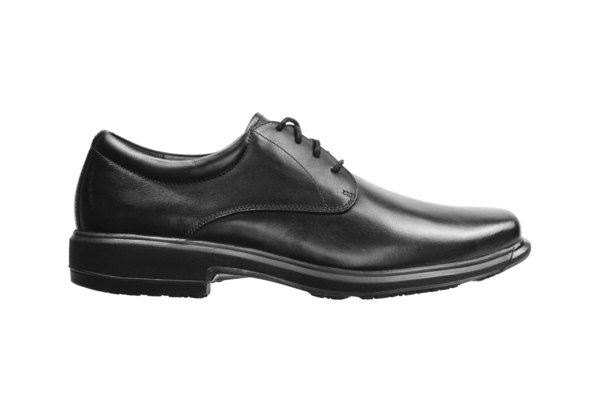 Where is it: The midsole of the shoe, which is the part under the foot, between the outsole and the upper. Benefit: Cushions and protects the area directly underneath the foot. Assists in keeping the foot cool, and controlling sweat. What is it: Open cell soft urethane foam. Where is it: Used in insoles or directly underneath the insole (inside the shoe), and is full length from toe to heel. Benefit: Supports the arch area of the foot (midfoot), and reduces stress on the ligaments that often cause fatigue and pain. What is it: Hard, moulded thermoplastic (TPU or Nylon) or hardened rubber. 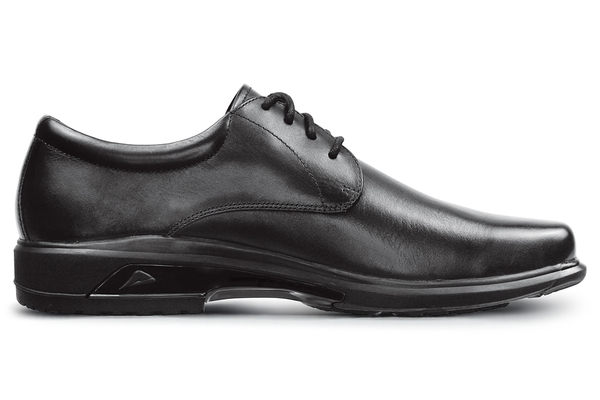 Where is it: Midfoot region of the outsole of the shoe. Benefit: Supports the arch area of the foot, and prevents the shoe from bending in the wrong place (in the middle of the shoe). The shoe should naturally bend across the joints in the forefoot region. What is it: A hardened nylon piece. Where is it: Placed internally (in the sole) in the arch area of the shoe. Benefit: Supports the ankle and holds the heel firmly in place, providing excellent stability when the foot first strikes the ground. A firm heel counter is essential for fundamental support and stability. What is it: Rigid plastic material that is shaped to match the contours of your heel. Where is it: Inside the upper part of the shoe, surrounding the back and sides of the heel. 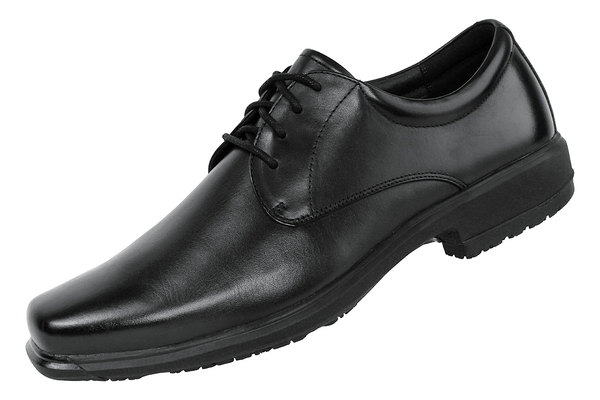 Benefit: Wicks sweat away from the foot, and its anti-bacterial properties control odour inside the shoe. What is it: Specially treated textile lining (patented technology by DRILEX). Where is it: Inside the upper of the shoe. The lining is the part of the upper that is closest to the foot. Benefit: Hard wearing and breathable, becoming richer and deeper with wear, molding and adapting to your foot like no other material. Resistant to high temperatures, resistant to tearing, cracking, and peeling. It’s naturally insulating, but also breathable. What is it: Natural full grain cow hide, tanned and dyed through with authentic techniques. This is the premium grade of leather. Provides sufficient slip resistance to prevent a fall when working on a low friction surface such as oil spilled on metal, or on soapy wet tiles. This is the highest level of slip resistance. Achieves the highest slip resistance rating (water on tile and oil on metal). Arch support insole with increased arch support and more cushioning. Removable, and so able to be replaced with orthotics if needed. 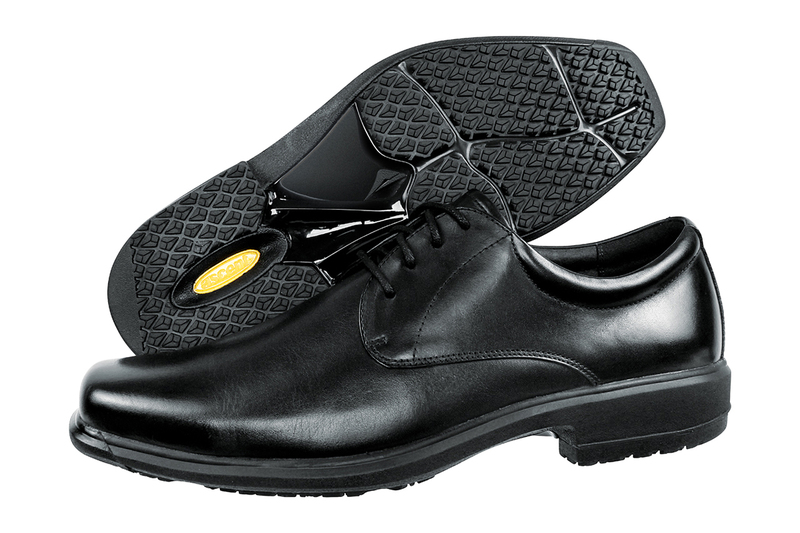 Customised fit to suit any foot type. Add extra cushioning or remove the bottom later for extra width. Soft, lightweight cushioning that absorbs impact shock. Cushions and protects the area directly underneath the foot. Assists in keeping the foot cool, and controlling sweat. Supports the arch area of the foot (midfoot), and reduces stress on the ligaments that often cause fatigue and pain. Supports the arch area of the foot, and prevents the shoe from bending in the wrong place (in the middle of the shoe). The shoe should naturally bend across the joints in the forefoot region. Supports the ankle and holds the heel firmly in place, providing excellent stability when the foot first strikes the ground. A firm heel counter is essential for fundamental support and stability. 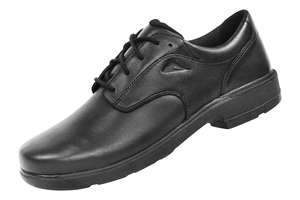 Wicks sweat away from the foot, and its anti-bacterial properties control odour inside the shoe. Hard wearing and breathable, becoming richer and deeper with wear, molding and adapting to your foot like no other material. Resistant to high temperatures, resistant to tearing, cracking, and peeling. It’s naturally insulating, but also breathable.